I know there's a name for these things but I can't remember what it is and it's remarkably hard to search for information about dictionaries — the search engines insist on bringing up dictionary definitions of the keywords you try. Anyone know the word? And here's a patent for a device to cut index notches. Wikipedia calls this a thumb index. 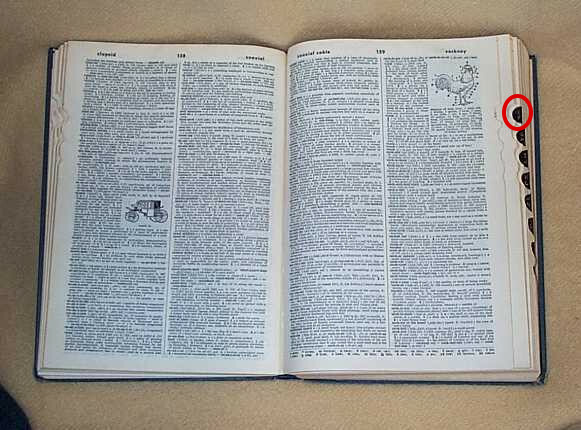 It is also frequently used with bibles for quickly finding each book. EDIT: To clarify, this refers to the whole set of notches. The individual notches can be called thumb tabs (as given by Chris H in the comments), index notches (as given in Davo's answer), or thumb notches. For the want of a special word I would call them "tabs'. To distinguish them from the tabs on files perhaps we could name them as "index tabs". Is there a name for “near the opposite side of the earth”? “Each of us will tell you our own side ___ the story”? What's the name of the color printed section in a book? What's the other side of Inheritance?